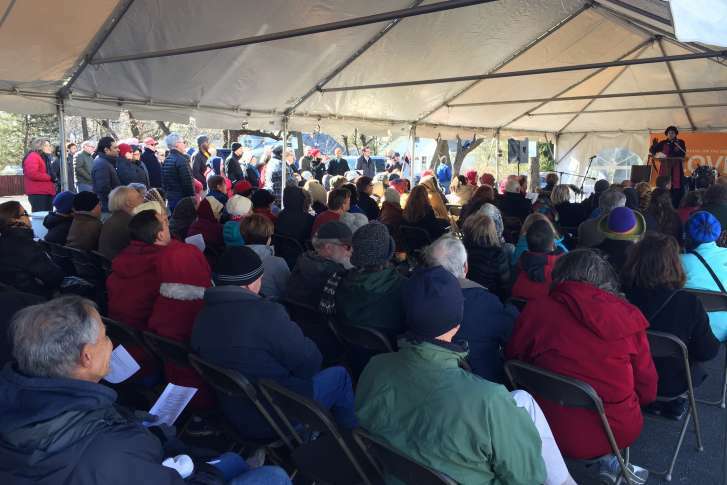 ALEXANDRIA, Va. — More than 100 people gathered in the Alexandria section of Fairfax County on Saturday afternoon in protest of the recent detainment of six people shortly after they had left a church shelter last month. The detainment happened Feb. 8 in a shopping center across the street from the Rising Hope Mission Church, just off Richmond Highway. Kincannon said he’ll continue to preach that sort of messaging regardless of the political climate. Virginia Lt. Gov. Ralph Northam was among the dozens who stopped by to show support. Little is known about the six people who were taken away by U.S. Immigration and Customs Enforcement agents or why it even happened. Oscar Rameriz was there when it all happened. “About 14 officers, they stopped us over there,” said Rameriz, pointing at a shopping center across the street. Rameriz said that only he and one other person were released. Kincannon said he thinks the raid was more of a fishing expedition through the local Latino population. “There were people that were taken away here for no apparent reason other than they seemed to be Latino from other counties,” he said. He said his church would continue to open itself to anyone who in need of service. “We don’t ask your immigration status any more than we ask you your political affiliation,” he said.